She had been fighting for her life since September, but Wilmington firefighter Ardythe Hope passed away on Thursday night from her injuries. WILMINGTON, Del. (WPVI) -- She had been fighting for her life since September, but Wilmington firefighter Ardythe Hope passed away on Thursday night from injuries suffered battling a blaze that was intentionally set. By Friday, black bunting was hanging over the entrance to Hope's last assigned post, Station #5. Wilmington's fire chief was emotional as he paid tribute to the 23 year dept. veteran, who overcame a brain tumor early in her career to win many commendations and awards for her service. "Ardy is the first female WFD line of duty death in its history," said Chief Anthony Goode. Hope suffered burns over 70% of her body in the row home arson of September 24 in the Canby Park section of town. Two of her veteran colleagues, Capt. Christopher Leach and Lt. Jerry Fickes, perished in that inferno. They were killed when the first floor collapsed. Hope charged in to try to rescue them, along with firefighter Brad Speakman, who was badly injured as well. 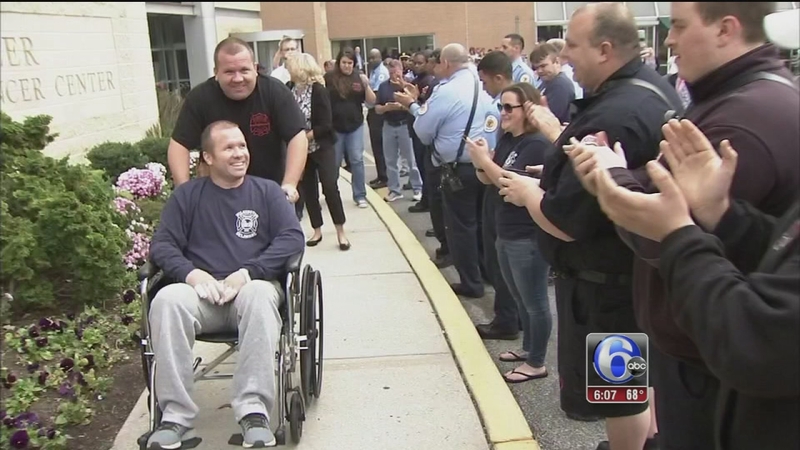 Speakman was released from the hospital last month, but his recovery continues. Hope fought for 68 days trying to survive her injuries. "We were called to the hospital, we worked diligently to get the family members to the hospital, for what we thought would be Ardy Hope's last night," said Goode. "And she lasted two more weeks." Hope was due to retire from the city's fire department In January, and was about to receive her nursing degree. She was a single mother of three. "I was with the family last night, in the hospital, during Ardy's final moments," said Goode. "I love that family," Goode said as he fought back tears. "And I appreciate and respect the ability to be there." As for the arson suspect, Beatriz Fana-Ruiz, she will soon be facing a third charge of first-degree murder in the wake of Hope's death. Fana-Ruiz, 28, who lives where the fire occurred, is also charged with four counts of second-degree assault, seven counts of reckless endangerment and one count of first-degree arson. What ignited blaze that killed Wilmington firefighters?